Many technicians spend a great deal of time researching a particular project, item of equipment, or protocol, only to later discover that one of their colleagues in a different department or faculty are experts on the subject, or that there is in fact a whole division of another department that specialises in that particular field. Traditionally, technicians work in isolation and this can have a negative effect on their ability to share knowledge and expertise. This can ultimately impact on the organisation, as staff morale and productivity are often low. It has been evident for some time that technicians are an under-recognised workforce; overshadowed by professional doctors, scientists and engineers. A HEI’s primary aims are to succeed as a research and teaching institution and to provide an excellent student experience, but the recognition for technical contributions in these areas is not always there. Every technician is a vital cog in this wheel. As such, the 21st Century Technician has become a collaborator of cutting-edge research, often resulting in co-author and first author publications in high-impact scientific journals. More than 50% of UK technicians have a degree, and a significant number have an M.Sc or Ph.D. They are experts in their own right, often presenting their research at national and international conferences. Long gone are the days of the stereotypical technician in a lab coat who only does the boring, mundane jobs. Lack of recognition is partly due to the increasing workloads and responsibilities, which do not permit technicians time to engage with the rest of the institution. Networking can increase technicians’ visibility by working outside of their siloed environments. In some cases, technicians are tasked with concentrating only on their academic’s particular project. Technicians can sometimes feel removed from the wider context of what a University is all about, which is fundamentally creating a great student experience. Every single one of us has a role to play within this. Unfortunately, it’s also a sad fact of today that some academics still view technicians as second-class citizens. There are currently more than 1.5 million technicians employed in the UK, however 50,000 of these are retiring every year. Forecasts show the UK needs as many as 700,000 more technicians in the next decade to meet demand from employers. Networking can address all these ‘problem’ areas. The majority of people appreciate that, in order to progress, you need to network in one way or another. How you go about this and become integrated into a network can be hard. However, by finding out about networks and meeting up with like-minded individuals demonstrates to the technical community that these are problems shared by many. By coming together, this allows those concerns to be discussed and addressed, for example sharing methods and expertise. By becoming involved in a growing network, technicians are able to demonstrate to line management the momentum and involvement of technicians as well as senior personnel. In doing so, management may see an increase in morale and engagement with job roles – which has a positive effect for all. The technical workforce has a vast range of transferable skills which are often unseen. Working together and networking opens up potential to work in other areas, either in secondment roles or perhaps in deputising tasks. Staff development can feel restricted and unsupported, however networking is a means to identify such issues and address these at a staff development level. This can allow for professional development within the technical pool and utilisation of home-grown talent to provide training to others. Showcasing technical expertise at networking events highlights the important role technicians play in today’s HE research and teaching institutions, this is often overlooked by academics. Bringing together technical expertise at networking events can provide collaborative opportunities for cross department/faculty working. It can also provide a more efficient and effective way of working, either by sharing of equipment or expertise, which avoids the unnecessary duplication of processes. What does this guidance provide? This guidance provides support and suggestions on how to create a physical and a virtual support network for technicians. It will provide access to career signposting, mentoring opportunities and give examples of sharing good practice. This guidance is based on current networks that exist across the HE section. There is also an example guide (see “The First Event”) for things to consider or carry out at your first network event. What is a technical network? Networking contributes to the development of sometimes ‘unknown’ existing relationships. It can be the start of something that will grow and grow and provide significant benefits. Developing and maintaining a network is challenging, however, with perseverance, your network has the potential to make a difference to the workforce sector as well as the organisation involved. Do you need a network? Why do you want a network? What would you hope to achieve through a network that can’t be/isn’t being done in other ways? Is this a physical or virtual network, or both? Who would the network be for? Who do you feel would be interested in this network, and why? If the demand is not there, then chances are your network won’t flourish. Who would it be open to, for example, would it be everyone in the technical community at the University? Do others share your view? Are there colleagues who share your views and could actively help to take the idea forward? What is currently out there? Are there other existing networks that could be exploited/added to? If there are already networks within the organisation which can be tapped into, then it is probably a good idea to try and engage with this. Technicians will only engage with networks which are of benefit to them, and creating too many networks can have a negative effect. Are there structural or cultural issues that might prevent an effective network? What could be done to overcome these? For physical networks e.g. no obvious time when all could be available, there may be opposition from managers who might not release technicians to attend. In order to be successful, you need to exploit a gap in the market. If the demand is not out there, then chances are your network won’t flourish. Speak to your potential stakeholders. Ask them what they want from the network and how it can help them both now and in the future. E.g. Support with moving their career forward. Establish clear and attainable goals. Be clear about what you want to achieve from running a network. Build a proposal for a technical support network highlighting the benefits to the individual and the organisation. This can be used as a powerful marketing tool. Link to any current networks that exist in your organisation (this would save resources and could give the scheme the head start it needs). Create a technical ‘arm’ as part of an established scheme. Gain support from a key or influential senior staff member. This will show that the network has strong leadership and presence. It will also allow possible access to that staff member’s own network. Ask influential stakeholders to provide a positive statement about the network that can be used for marketing. Do you want to target purely technicians, or will there be a wider audience? For example, groups such as procurement and Human Resources have direct links with the technical community and their input can be beneficial to both parties. Below is an example of the link between procurement and technical staff. Procurement and technicians work closely with one another, however each of them on their own understand very little about the other’s remit. Technicians have a substantial amount of buying power and a broad knowledge of why they need the products they buy. Often, procurement is required to source and provide suppliers who offer the best value for money options. These do not necessarily fit alongside the requirements of the technicians. By working together more closely, and discussing problem areas (what works well and what doesn’t), technicians and procurement can become more efficient and effective, ultimately delivering a better service for all. Engaging technicians and procurement with networking events is a way of bringing the 2 work areas together to improve service. Do you intend to have external speakers? Will you invite other persons in similar roles from other institutions to your events? Will the format be formal or casual? Will you have a structured session which follows a template format each time? How will you manage the speakers? Will there be a discussion at your events? Who will Chair your events? How will you get people talking/networking? (Find the most appropriate means to create structured conversations on topics participants want covered). Will you have a steering group or a committee? An internal network is simpler to manage than an external one once the internal network has become established and successful, then exploring how this could be disseminated more widely may be an appropriate option. A good lead into this is to visit other networks at other institutions and see how these operate. This may lead to a joining of networks across institutions. Enlist the help of your organisation’s marketing department – they will have endless contacts. Find out where technicians are currently looking to find help with careers signposting and networking. Set some specific characteristics of your network and outline how they are different to other competitors. Outline how your network will be of value and benefit. Invest in business cards carrying the network’s details. Use Twitter or other social media to get your name out there, so people know who you are and what events are coming up. Advertise on the homepage of your organisation’s webpage. Promote your network at conferences, meetings, exhibitions and other events you attend. Arrange to have an informal chat with event organisers during the coffee break. Ensure you can provide examples of positive outputs. Consider how you will market your events. Will you compile your own email mailing list from both yours and your team members’ contacts? Link this in with the organisation’s full email directory to target those people who are not technicians but could be useful to the network. In future, obtain the contact details of all attendees at each event and incorporate them into the mailing list. Be careful when mailing en masse as this can have its downfalls in promoting a negative effect amongst recipients. Make the title of the emails effective and specific. Invite key influential figures to some of your sessions to demonstrate the impact you have now and what difference it can make to the wider sector. Invite external speakers to your events. This will result in the event being publicised within the speakers’ place of employment. Another person’s perspective can often lead to inspirational ideas for your own network. Engaging ‘champions’ for your network will aid in the promotion and marketing of events. Use champions within your network to disseminate your vision, and promote your aims and objectives to those people that matter. By enlisting champions in certain key areas you will benefit from the knowledge which those individuals have. They can then approach their technicians to engage them in the network. Encourage your champions to feedback the views and concerns of those technicians in their work areas. This can be greatly beneficial when looking to find topics which are relevant for future events. This also has a positive effect, as it demonstrates to those individuals that the network is listening to them and seeking to make a difference. Promote the champion role as a personal development tool and one where valuable experience and continued professional development can be gained. Who will be Chair and will this be a rotating position? How many members do you require on your steering group? How much input do you expect each individual to have, will they have a set role? Set up a minimum number of steering group meetings which each person is required to attend in a 12-month period. Who is responsible for making the decisions – is this a collective majority vote? Ensure that you have a 2-way dialogue between your participants and your steering group – your network should provide an exchange of ideas. You will be able to action some of these suggestions and ideas but not all of them – ensure you manage the expectations of your participants, otherwise you will lose engagement and momentum. Your network will benefit from having a clear set of aims or objectives. These can be very specific or more general. Supporting technical staff in gaining a specific technical or equipment-based skill. Helping technicians work towards professional recognition. Finding a mentor for a network member. Supporting existing mentors in developing their mentoring skills. Acting as a central meeting point for technical staff within a specific discipline or from a certain geographical area. Wanting to create a physical or virtual forum (or both) where technical staff can discuss issues openly and without prejudice. Aid in promoting equality and opportunity for technical staff. Through your research you may find that your aims can’t be addressed by the networking group alone and that you need to create further groups to achieve them. For example, do your members need mentoring or work shadowing opportunities? If so, you may want to consider setting this up formally/informally. This could be internally or across institutions. The steering group you choose to support the network is vital and can be the success or downfall of a group. The individuals are probably best selected from calls for expressions of interest from the participants at your events. After all, you are trying to run a network for technicians by technicians. The steering group can also be referred to as a committee. The network will benefit from selecting a steering group that is made up of people who have the required skills to run it. E.g. an IT-skilled person who knows how to create webpages, or an individual who has finance/procurement experience. Remember, the majority of your colleagues will be very busy and have increasing work pressures and deadlines which they are required to meet. Therefore, bear in mind frequency, location and time of your meetings. Also consider defining roles within the steering group and how the group will be managed, for example, does the Chair have the final vote or are decisions collaborative? Treat all others at the event as equals and respect each other. Make sure your attendees know who to go to for information – it can really help if your steering group members wear name badges. Go out of your way to welcome your participants – make them feel included. Ensure each of the ‘speakers’ knows how to use the IT/AV system. Get all their presentations loaded onto the computer at the start of the event so that the audience are not waiting in between presentations for documents to load. It is vital that whatever format you go with, you allow sufficient time for participants to talk to one another. The relationships which people are building at your event may be what keeps them coming back. If you see people sitting alone, introduce them to a person at the event who you know has been coming along for a while, to act as a buddy. Networking events are about helping each other – be mindful of this. If your efforts aren’t genuine you will not be effective and your participants will not come back to your events. You won’t know the answers to all problems but you will most likely know somebody who can help – try to use referrals in cases where you personally don’t know the answer. Actively follow up any enquiries and feedback to the individuals. Advertise the next event at the end of this meeting. Collect any paper copies of feedback forms. Thank anyone that has helped support the delivery of the event. Hold a quick steering group debrief session and arrange a central point for all questions, issues or comments raised at the event to be collated. Decide who will act on the feedback or will it be distributed across the steering group? You need to find out what your participants are interested in and then seek to provide a diverse array of opportunities for the members in your network. A platform for members to provide feedback about the forum and events is essential. The feedback can be collated and acted upon as necessary. This will also help to direct the topics focussed on at events and generally across the forum. Ensure delegates know who the steering group are (personal profiles) and how to contact them directly if required. Some delegates may want to ask a question but they do not want to use the public feedback system. The aim is to have people returning to subsequent events and for them to build on relationships possibly formed at the first event, or even start new ones. People return to subsequent events. New people attending as a result of recommendations by existing members and numbers grow. Feedback provided is positive and constructive. Delegates see the value in your events. Event format is efficient and becomes easier to organise. Success can also be measured by positive actions which bring about change. For example, process improvements to systems, individual career development opportunities. It is important to ‘hear’ about such examples from delegates/members. Survey attendees between meetings and ask what they liked about the previous session and how it could be improved. An easy way to do this is to circulate feedback forms after each event. Consider creating an electronic newsletter where you highlight the work of individuals who have shone. It’s also a great way to promote your future events as well as a way to ask for feedback. Action the most appropriate requests and feedback to the participants why this was chosen. Demonstrate why some topics aren’t chosen but are supported by the group or not supported at that time. For example, a recent suggestion was to host a question & answer event with Estates Facilities Management, however, due to restructuring of this department, it was decided that this event, whilst important, should be scheduled for a more appropriate time. Realise that you won’t agree with everyone’s feedback but the fact you asked sometimes makes all the difference. You’ll get some great ideas along the way. It is essential that, even though you may not agree with all those suggestions, you action the most appropriate ones, as failing to do this will result in serious dropout figures. Your first networking event will need to be the inspiration and drive for future sessions. Detailed planning is essential. Use the first event to gather information about what users need from a forum. This will then help steer the subject of future events and links. For subsequent events it is worthwhile exploiting other events e.g. researching speakers and themes. Be careful that this does not take over your diary. Make sure you involve other members of your network to help manage this and prevent overloading yourself. Other team members will see you as a person who goes out of their way to actively encourage participation and involvement by other team members, thus developing their roles and responsibilities. Ensure each steering group member has a defined role and that they are all directly involved. Try having a steering group member on each of your tables to act as a facilitator and support that group of participants. Outline the objectives of the first event to all members of the steering group so that feedback is relevant and consistent. Consider the time of year for your first event – taking into account imminent holidays, busy exam periods etc., when traditionally people are otherwise engaged in their work activities. Book a location – given that you will not have an exact idea of the number of attendees, it is better to go for a slightly larger venue. Delegates need to have space to move around and talk to other delegates. Round tables are a good option. Keep in mind the budget – it might be that you could use one of the institutions where a member of the steering group is employed and therefore there may be no charge. Advertise the event well in advance. Use social media, University Homepages, email contacts, posters and try adding the event onto meeting agendas. Providing refreshments, even a sandwich lunch, will help draw your initial crowd. Ensure your catering arrangements are all in place well in advance and that there is a budget available to pay for it. You could get sponsorship from an external supplier for your first event in exchange for them having a ‘pitch’ at the event. Have a detailed schedule including timings of the whole event. Produce a programme guide for delegates to see before the event as they need to know what the content is and whether they would like to stay for the whole event. This can be as simple as a distribution leaflet or a web page advert. If people are giving presentations or you are carrying out electronic surveys (e.g. Turning Point) that involve the attendees, ensure that the AV equipment is set up accordingly. Do you intend to do an introductory presentation to begin? 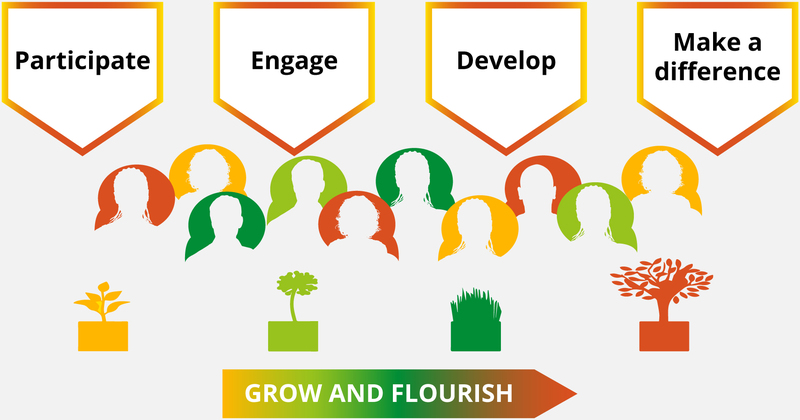 The network has the potential to grow internally which can lead to growth outside of the organisation. This can lead to the development of cross-institutional networking. Build on the relationships nurtured within the network and utilise these to provide you with Champions for the network who will help coordinate events and promote your ideas and values further afield. Once you’ve decided to set up and run a network you will quickly realise that this presents its own challenges. This will mainly be confined to keeping the steering group engaged and involved. Best practice shows that steering group meetings work best when scheduled prior to events – so that steering members can have input and the events can be organised and managed accordingly – as well as shortly after each event to disseminate feedback and action anything which can and needs to be actioned. Maintaining momentum can be hard, people have busy work lives and so the benefits of engagement need to be reinforced. It’s a good idea to have enough steering members so that events can be managed well enough without the full steering group complement. Careful thought needs to be given to this, and it may be necessary to draw up a written agreement so that people think carefully before committing to the steering group. If not managed and maintained carefully, the Chair(s) might find themselves doing all the work which may ignite tension and stress, resulting in potential collapse of the network. Involve and invite senior members of the organisation – a great way to showcase technical work as well as demonstrate that the network has support from senior management. Increased confidence and raising of their personal profile. Develops skills in organisation and event management. Acting as a positive role model to other network members. Develops strong verbal communication skills which in turn allows effective communication to a wide range of audiences. Able to engage and motivate colleagues. Share common goals with colleagues – reduces feelings of isolation. Allows ways to find out what’s happening in your organisation, for example, this can be about how decisions are made, upcoming organisational change strategies and how you can get involved. Raises the profile of the organisation. Allows the sharing of best practice and resources. Development of staff leads to increased productivity and career satisfaction. Raises the organisation’s awareness of the technical community. Encourages individuals to form relationships across other departments and faculties. Can aid in problem solving, answering technical questions. Provides a pool of technical expertise that can be used to save on training costs, equipment costs. Contributes directly to career progression and job opportunities. Raises the profile of the institution by being seen to be promoting technical values and celebrating the workforce. Enables individuals who show potential to grow – this may increase income generation further down the line. Utilises the staff you have to provide training internally. By using your talent pool you can deliver cost-effective training to other staff. Technicians feel more aware of the wider remit of the organisation and more included, and as a result they are more receptive to change and open to new and novel concepts to promote better ways of working. Promotes a sense of feeling of worth and wellbeing which, in turn, will promote motivation and inspiration. A great way to find out about what other technicians do – potentially leading to job swaps or work shadowing opportunities. A way to make a difference and change organisational procedures and policies. Creation of career development opportunities via potential requests to talk at in-house events and also external events. Opportunities to purchase equipment as a group – so reducing costs and reducing repeat purchases of expensive equipment.